Light microscopes enabling super-resolution imaging suffer from a standardized quantification method. We demonstrate the quantification of a super-resolution microscope by using standardized DNA origami samples with the help of two leading camera technologies (EM-CCD and sCMOS). Recently, the Nobel Prize in chemistry was awarded to Stephan Hell, Eric Betzig and William E. Moerner for their groundbreaking improvements in optical and single molecule microscopy. Their fundamental work and innovative approaches made it possible to image structures smaller than the diffraction barrier of light (~200 nm), a limit which was first introduced by Ernst Abbe 1873. The development of novel types of microscopes, so called ‘super-resolution’ microscopes, enabled the visualization of biological processes on a molecular level and improved the insight in diverse fields of biomedicine such as neuroscience, morphogenesis or drug delivery, to name a few. Researchers developed a large number of methods to overcome the diffraction barrier based on spatiotemporal fluorescent switching. In this paper, we performed a standard single molecule switching nanoscopy (SMSN) technique to demonstrate how two camera technologies (EM-CCD and sCMOS) can resolve the world’s first standardized nano samples. 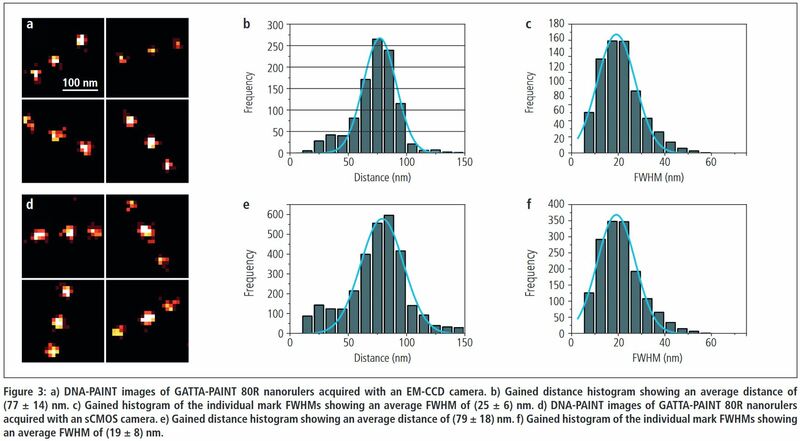 The utilization of nanostructured standards from GATTAquant GmbH offered the opportunity to test the super-resolution capability of Hamamatsu ́s leading camera technologies in a quantitative and reproducible way.